After one year, Wim Coekaerts blogged again! He explains very well what he did in the last months and what the Oracle Linux program is all about. The last weeks I also got a lot of questions about "Oracle linux" and if it was a distro or something else? In fact it's a support program from Oracle, so not a real "distro". The source is the same as Redhat Enterprise Linux (RHEL), but the trademarks are removed and replaced by Oracle ones. The complete package is free, you only pay for support! We HAD to re-brand the RHEL setup because you just can't get free for download from anywhere. So we take out trademarks, copyrights and graphics and we replace it with, well, other names and definitely a cuter logo ! Between Red Hat, Novell and Oracle, we 're the only one with a penguin as a mascot ! duh. And that becomes our "distribution". Do we want to fork ? No, not at all, not one bit, do we do this for fun ? No. Do we do this to create more work ? No. We do it because that's the only way we can build a CD set based on an open source product from an open source company that we can make available for download for free. The Unbreakable Linux Network can be found here. Did you know that this site is written in Apex? ;-) You see; Apex is all over the place! I'm preparing my white paper for Collaborate 07 about ApEx Shared Components, more in particular, today, I was searching for more information about the "Build Option" as I didn't use it that often in DG Tournament. While I was googling "build option apex" I came on some unexpected sites. Of course when you put oracle with the other words, it should filter better. They have nothing to do with the Oracle Apex... or do they? 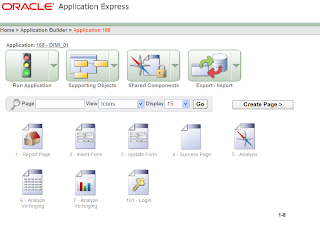 It was really confusing as SQL and development framework are really Oracle Apex related. I knew Apex was a more known "name", due to the Google Fight I did some time ago. APC (Andrew Clarke) also made the comment on my blog, but today it was the first time it popped-up so hard to me... so I must agree with his statement, that HTMLDB was a better name to find immediately the right results! Just saw the below picture on Tom Kyte's Blog and I couldn't stop myself not to blog about it. I just wonder why they didn't write MSFT (or M$)?! Apparently SAP is a bigger competitor now? or it was somebody from the "Suites"-group and not from Technology. When I was still working for Oracle, you had the "Apps"-persons and the "Technology"-persons, don't know if it's still like that. For the people playing in DG Tournament, don't forget to bet on the next round of the Champions League. On Tuesday it's again football time! For the APEX people, reading this... I added a new feature in DG Tournament. Thanks to Patrick Wolf's Framework, I made the "Your message" textarea resizeable. Patrick also made a new version available of the APEX Builder plugin. 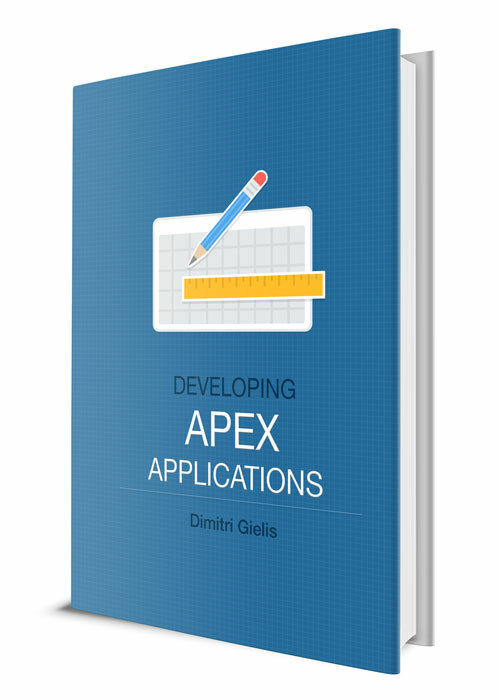 This plugin enhances the Apex Builder development environment. In the beginning it wasn't easy for me to get it configured, but now it works great! Basically you need to download the Greasemonkey add-on for Firefox and do File - Open File and load Patrick's file. 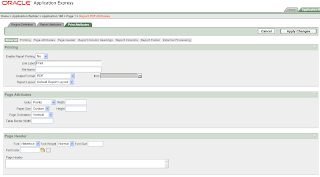 The latest download of the Apex Builder plugin has a terrific How To! To see the plugin in action, here's a nice video. As I already blogged at the end of last year, my goal for 2007 is to promote Oracle and ApEx even more. But honestly, I'm not sure that's possible, as during the day I only speak about Oracle and at night I dream of it! In the past, I promoted ApEx through this blog, by making applications with it or by talking to customers about it. In 2007 I want to go a step further! In the coming weeks you'll read more about it, but I can already announce that I'm currently building an ApEx-team (first in Belgium). I dream of guiding the people in the wonderful world of Oracle and ApEx and I hope to find a lot of ApEx-projects for this team. If you're interested to join this team, you may sent me your cv by mail. I just read the statement of direction for the Oracle Database on Windows Vista. As Application Express runs completely in the database, this implies that ApEx will get fully supported at the same time. Below an update of the Application Express sessions at Collaborate 07. 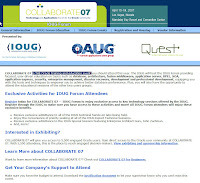 I had another look at the Collaborate 07 site. A lot of new info is available about this Oracle training and education event. Speaker: Tony Jedlinski, Roman Inc.
As already said before we're also organizing another APEX Meet up. You can register here. Here're some screenshots after my first run through APEX 3.0. The first page is still the same, but when you go into an Application, you've now real icons. The drag and drop feature isn't easy to find... Go to the items sections and you'll see a little square icon. Click on that and you should see this new feature! That's it for now... more screenshots later. APEX 3.0 sees the light! 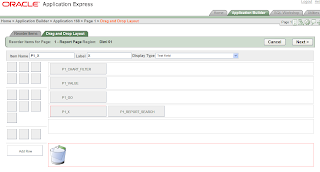 You can now register for the early access release of Application Express 3.0. I already registered, but I'm waiting for my password ;-) In the next hours I'll post some screenshots about this new version. Ooh boy, if I see all these nice features, I can't wait to get APEX 3.0 up and running! Also: if you review APEX 3.0 don't forget to give some feedback in the feedback application.